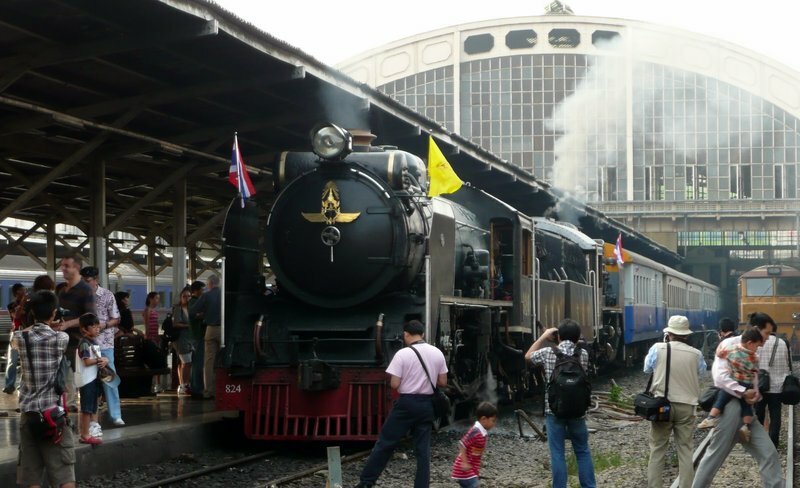 Three times a year the State Railways of Thailand pulls out a pair of their old steam engines, fires them up and operates a round-trip from Hua Lamphong Station in Krungthep to the former capital of ancient Siam, Ayutthaya. 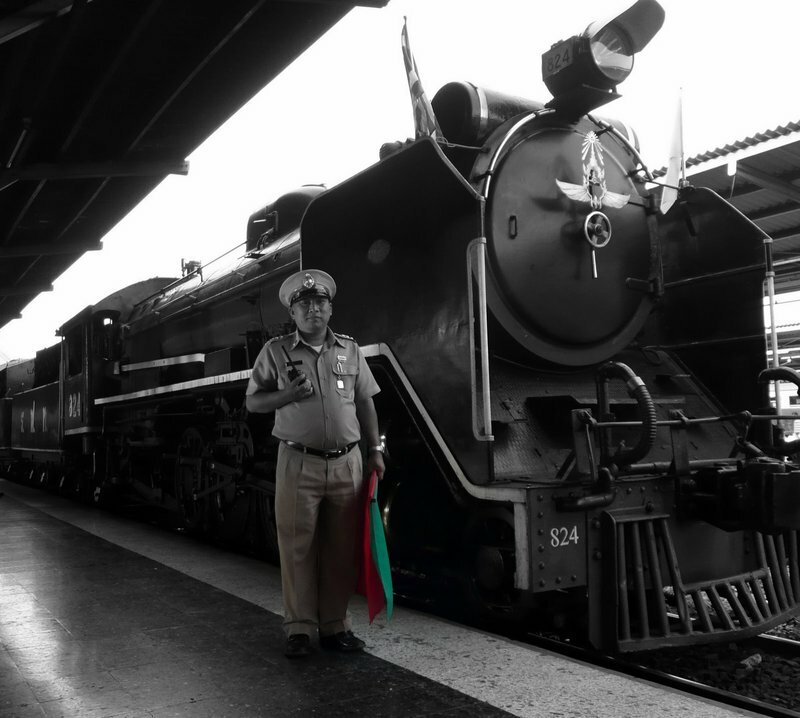 The three dates are the birthday of His Majesty the King (December 5), the anniversary of the opening of the first railroad service in Thailand (March 26) and the anniversary of the death of King Rama V (Chulalongkorn Day, October 23), under whose guidance this first railroad service was introduced. Setting out about 7:15 on a cool Saturday morning, I made Hua Lamphong Station my bike ride destination. I arrived there twenty minutes later and, it being a holiday, found the station pretty busy with people traveling to and from the provinces. Rail travel is heavily subsidized (State Railways has never turned a profit) and so the masses travel its more than 4,300 kilometers of tracks to get to and from their homes in the provinces to their work in Krungthep. The station itself has a graceful, European style and the exterior is done in Thai Art Deco. 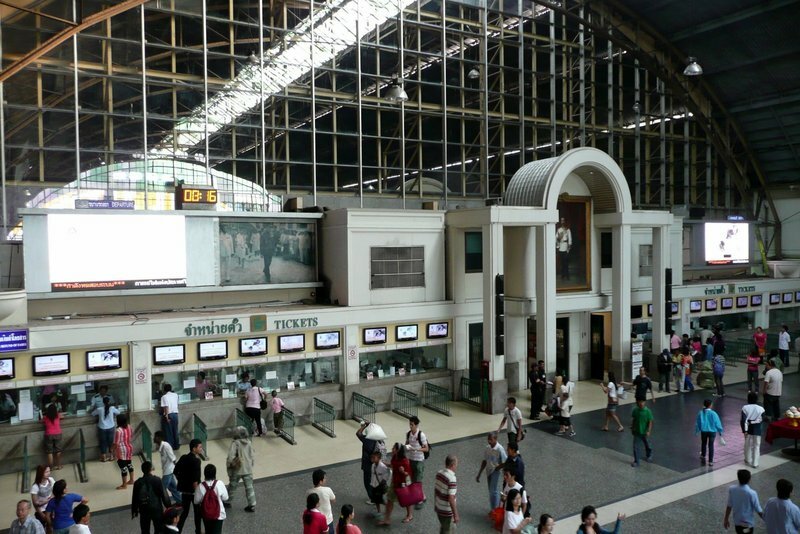 While railway operations in Thailand started in 1897, this new station didn’t open until 1916. There were lots of excited passengers waiting for the ride, taking pictures and looking on with fascination. Families were climbing onto the front of the engine to pose as people took their pictures. The railway officials seemed largely unconcerned with the people on the tracks. The train on the right in this picture actually arrived and departed while I was standing there and it just moved very slowly and honked its horn a few times. Nobody was injured. 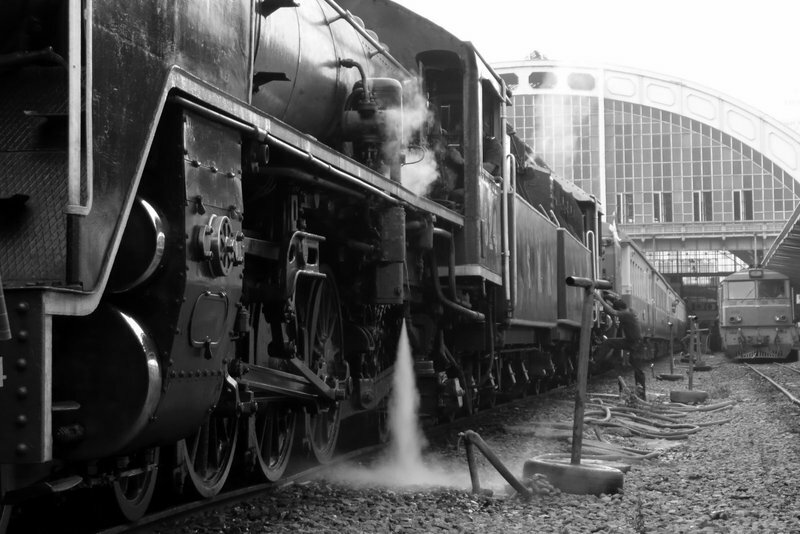 Shooting a black steam locomotive is tough. Trying to set exposures is challenging. I also noticed afterwards that the pictures almost uniformly look better in black and white than in color. There’s so much texture. At eight a.m. the national anthem played as everyone stood at attention. Then, a moment later, the signal man blew a whistle, waved his green flag, and the train slowly pulled out of the station. Had I not been on bicycle, I would have ridden it to one of the stations at the north end of town which connects with the subway. That would have given me twenty minutes or so of a ride without committing to an entire day out of town. Maybe in March I can coordinate better and take the ride. 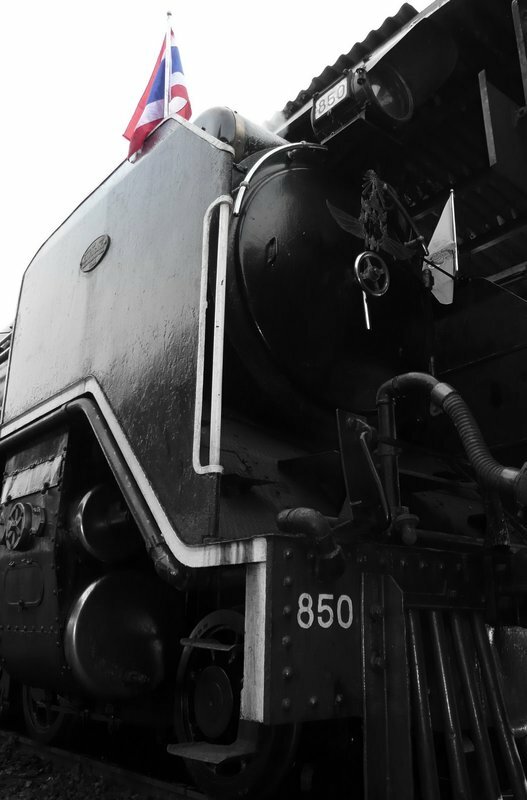 This entry was posted in Uncategorized and tagged Hualamphong, Railway, Steam Engine, Thailand, train by christao408. Bookmark the permalink. Nice photos, especially the black and white ones with a splash of color! I love the B/W shots! So beautiful. Nice shots! I’m thinking about getting a small camera for my bike rides. It’s been cumbersome lugging around my Nikon DSLR. By the way, December 10 is “Constitution Day” – the King’s Birthday is on the 5th! I’m singing in the choir in the King’s Birthday Celebration performance at Rama V Statue Plaza (Dec 5 – 13). @Poom – Oh, I knew that. Sorry for the mistake, must be the antibiotics typing. Correction made. Hope you have fun with the celebration. @Dezinerdreams – @HiROBii – @CurryPuffy – Thanks, I was really surprised how nicely they turned out in black and white. All the photos were interesting – but I like trains. The angle of the last shot had me thinking it was B&W until I saw the flag… lots of texture in that one. Hope you’re feeling better. They give you scrubs to wear instead of the awful hospital gowns!? I so would rather be sick there. Very nice. What’s the symbol in front of the train? that’s pretty awesome that they still have and run steam-powered trains! i used to love trains as a kid, although there really aren’t any in hawaii anymore. my boss loves taking the train instead of flying (although i think it’s his excuse for spending more time traveling and less time working hahah). Nice photos. This reminds me of the celebrations for the 100th anniversary of the NYC subway system when they took out older trains during some weekends. It was fun seeing people who didn’t know about it staring at those trains when they’d come into the station. Great pictures! When I was younger, my family and I went out to Southern Colorado and took a steam engine ride down into New Mexico and back. It was a really awesome trip. 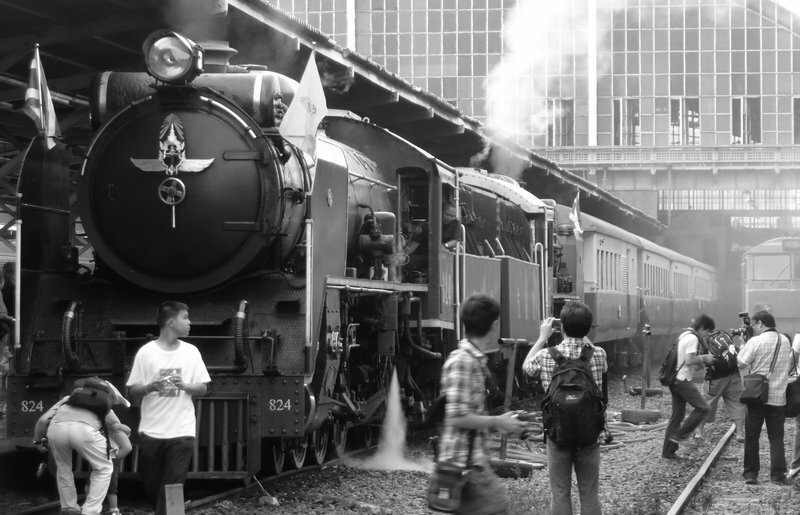 Old trains like that are so cool. I’ve loved trains since I was a young child. I still love them. Have you ever been on the Wine Train up in Napa?Also, nice work with getting the exposure correct, yes black is difficult to get right. I completely agree, the pic in B&W are nicer. Gives it a nostalgic feel. Cool! Love the B&W’s. I love vintage trains. The Sacramento train museum is a must see here in California. This was exactly the way it was when I was growing up Chris.They still had the steam engines when I left India in mid sixties. These pictures look great. Both the colored and the b&w. this is awesome. i love trains and i wish there were more steam engines actually used around the united states. I know they are less powerful and less efficient then other engines, but there’s something about them i can’t get over. @agmhkg – Time travel! @laurenmoo – They really add a sense of romance and sophistication to travel, don’t they? Instead of being a casual affair, they make the travel seem like a big deal. Southwest Airlines just doesn’t give it the same feel, do they? @murisopsis – Yes, we do have scrubs here. Aka kung fu pj’s. =D@kunhuo42 – @TheCheshireGrins – When I was about six or seven, my family and paternal grandparents took the California Zephyr from Denver to Salt Lake City. Left Denver at 6 am and arrived in SLC late that night. What an amazing experience. I’d like to take my nieces on that trip one of these days. @TheLatinObserver – That would be a trip to be waiting for the subway and suddenly have some antique train cars arrive. @yang1815 – The logo of State Railways of Thailand. The top half of the logo is the royal cypher for His Majesty King Rama IX (current king) as seen here. The squigly character in the middle is the Thai number nine. @arenadi – I’ve heard of it but never ridden. Wine plus a train ride sounds like a good combination. There is something similar in the Yarra Valley. @brooklyn2028 – Yeah, it really could be 100 years ago, couldn’t it? @stebow – Fifth grade field trip to Sacto included riding the train from San Jose at some ungodly hour of the morning, visiting the capitol building, then going to Old Town to see the museum and eat an early dinner before taking the train back. Still one of my favorite things to see in Sacramento. @rice_eric – Thanks, certainly brings out a different feel to the pictures. @ZSA_MD – I thought you might really enjoy the pictures for their nostalgic effect. Railways are such important transport links in many countries. I know they have a special place in the life of India, too. @christao408 – That is a pretty cool symbol! Nice pics… love the b&w shots too. I had no idea folks can jump on to the tracks to take pictures. Isn’t that dangerous? Oh wait… that’s the farang in me talking again.